Home / Conservation News / Whitehall Park Purchase is Finalized; Permanent Preservation Guaranteed. 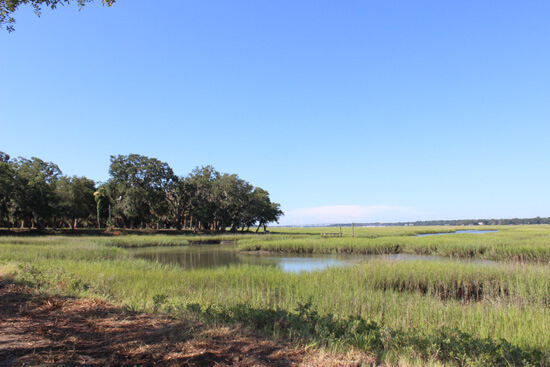 Beaufort, SC (Oct. 25, 2018) — The much anticipated purchase of 9.72 acres of scenic, riverfront land on Lady’s Island in the City of Beaufort, commonly known as the Whitehall Tract, to be permanently preserved as a passive park, was finalized on October 23. Announcement of the purchase closing was made by Barbara G. Holmes, Director of Land Protection for the Open Land Trust, Administrator of Beaufort County’s Rural and Critical Lands Preservation Program. “We are thrilled that this magnificent and iconic property will now be permanently protected for public access, recreation and education,” said Holmes, pointing out that the parcel, directly fronting the Beaufort River across from Henry C. Chambers Park in downtown Beaufort, was part of a larger 20-acre property formerly owned by First Chatham Bank. “The closing concludes an intense three-month approval process between the seller, the County and the City of Beaufort that was fueled by strong community advocacy efforts,” noted Holmes. Purchase price for the acreage was $5,450,000 with $4,371,000 in funds allocated from Beaufort County’s Rural and Critical Land’s Program, and the balance of funds coming from the Felburn Foundation, the Beaufort County Open Land Trust and public donations. Additionally, the seller has committed beneficial in-kind services and contributions toward development of the park. Whitehall Park is owned by Beaufort County and the City of Beaufort has agreed to maintain and operate the Park, with the Open Land Trust holding a conservation easement to ensure the Park’s perpetual protection. These entities will continue to work together, along with the Friends of Whitehall organization, to make the park an exceptional legacy for both residents and visitors to the area.